No. 3 Notre Dame (No. 3 CFP ) can pretty much wrap up one of the four playoff spots Saturday by winning at Southern California. No. 4 Michigan (No. 4 CFP) seeks to remain in playoff position Saturday when it visits No. 10 Ohio State (No. 10 CFP), with the winner facing No. 20 Northwestern (No. 19 CFP) next week in the Big Ten championship game. No. 7 Washington State (No. 8) also still harbors playoff hopes as it prepares to host No. 16 Washington (No. 16 CFP) on Friday, with the winner facing No. 18 Utah (No. 17 CFP) in the Pac-12 championship game. The Oklahoma-West Virginia and Texas–Kansas games on Friday will determine the representatives in the Big 12 championship game. If No. 11 Texas (No. 14 CFP) beats Kansas, the Longhorns will face the Oklahoma-West Virginia winner for the Big 12 title. If Kansas upsets Texas, No. 6 Oklahoma (No. 6 CFP) and No. 12 West Virginia (No. 13) would meet for a second straight week in the Big 12 championship game. Here are some other things to know heading into the final weekend of college football’s regular season. Michigan has lost to Ohio State each of the last six seasons but heads into this year’s game as a four-point favorite. Ohio State (10-1, 7-1 Big Ten) has looked more vulnerable than its record suggests, as the Buckeyes got trounced 49-20 by Purdue last month and eked out a 52-51 overtime victory over Maryland last week. Michigan (10-1, 8-0) has won 10 straight since a season-opening 24-17 loss at Notre Dame. 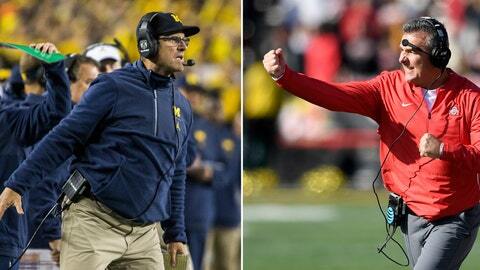 Michigan leads all Football Bowl Subdivision teams in total defense, while Ohio State ranks second in total offense. Minshew nearly decided to spend this season at Alabama, where he almost certainly would have backed up Tua Tagovailoa the entire year. The East Carolina graduate transfer instead chose Washington State and has emerged as one of Tagovailoa’s top competitors for the Heisman Trophy. After throwing for seven touchdowns last week in a 69-28 blowout of Arizona, Minshew leads all FBS players in yards passing (4,325) and is tied for the lead in touchdown passes (36). Tagovailoa ranks first in passing efficiency. Minshew faces perhaps his toughest test of the season this week as Washington State hosts Washington, which leads the Pac-12 in scoring defense and ranks second in the league in total defense. Heisman Trophy voters also should keep an eye on the quarterback matchup in the Oklahoma-West Virginia game with Kyler Murray leading the Sooners and Will Grier taking snaps for the Mountaineers. 3 — Vanderbilt is seeking to beat Tennessee for a third straight season, something that hasn’t happened since the Commodores won six straight over Tennessee from 1920-26. Vanderbilt is 4-2 against Tennessee over the last six seasons after going 1-28 in this series from 1983-2011. 5 — The number of touchdown runs No. 1 Alabama (No. 1 CFP) has allowed all season, the lowest total given up by any FBS team. Alabama’s opponent Saturday is Auburn, which has yielded only six touchdown runs this year. 19 — Oklahoma has won an FBS-leading 19 straight true road games heading into its game Friday at West Virginia. The Sooners’ last loss in a true road game was a 37-33 decision at TCU on Oct. 4, 2014. 22 — Fresno State hasn’t allowed any of its last 22 opponents to reach the 30-point mark. That’s the longest such streak of any FBS team. 36 — Florida State has played in a bowl game each of the last 36 seasons, an NCAA record streak. The Seminoles can become eligible for a 37th straight bowl berth with a victory Saturday over No. 13 Florida (No. 11). Florida State has beaten Florida five straight times, its longest winning streak in this rivalry’s history. 302-49 — No. 2 Clemson (No. 2 CFP) has beaten its last six opponents by that combined margin after rallying for a 27-23 victory over Syracuse on Sept. 29. This Friday matchup will determine which of these West Division teams will get to face No. 8 Central Florida (No. 9 CFP) in the American Athletic Conference championship game. Each of the last four Houston-Memphis games has been decided by four points or fewer. Houston will be playing this game without star quarterback D’Eriq King, who tore the meniscus in his right knee last week in a 48-17 victory over Tulane. Houston defensive tackle and 2017 Outland Trophy winner Ed Oliver has missed four straight games with a knee injury, but his status for Friday’s contest is uncertain. Memphis’ Darrell Henderson has rushed for 1,521 yards to rank second among all FBS players, behind only Wisconsin’s Jonathan Taylor (1,869). With angry USC fans chanting for Helton’s firing, the Trojans fell 34-27 to UCLA last week for their fourth loss in five games. Ranked 15th at the start of the season, USC (5-6) now must upset Notre Dame on Saturday just to become bowl eligible and avoid its first seven-loss regular season since 2000. Helton owns a 32-16 record at USC and led the Trojans to a Rose Bowl title two seasons ago. His contract was extended through the 2023 season earlier this year.